Location: Cappella degli Scrovegni, Padua, Italy. 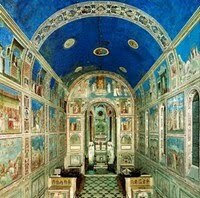 The Scrovegni Chapel fresco paintings are Giotto's greatest masterpiece of religious art and mark a decisive turning point in Pre-Renaissance painting of the 14th century. In simple terms, he abandoned the rules and conventions of the flat hieratic style of Byzantine art, in favour of a greater naturalism in both his figures and stories. As a result, Giotto (1266-1337) is not only viewed as the most important painter of Proto-Renaissance art (c.1300-1400), but also the greatest single influence on painters of the Early Renaissance (c.1400-90), such as Masaccio (1401-1428), Piero della Francesca (1420-92) and Fra Angelico (c.1400-55). The fresco cycle in the Scrovegni Chapel was greatly admired even by Duccio di Buoninsegna (1260-1319), the leading artist of the more traditionalist Sienese School of Painting, and ranks alongside the Sistine Chapel frescoes, as one of the most influential works of Christian art of the Renaissance era. The Scrovegni Chapel, or Cappella degli Scrovegni - an unpretentious building built out of pink brick - was commissioned by Enrico degli Scrovegni as a family chapel on the site of an ancient Roman arena - hence it is sometimes referred to as the Arena Chapel. Located in Padua, Veneto, Italy, its interior walls are decorated throughout by a sequential series of fresco paintings illustrating the Life of the Virgin Mary and the Life of Christ. Painted approximately during the years 1303-10, the pictorial theme is salvation - possibly because the chapel was intended to expiate the sins accumulated by the Scrovegni family as a result of their usury business. Occupying the entire west wall around the chapel's entrance is Giotto's rendition of the Last Judgment, which incorporates a devotional portrait of Enrico himself. The remaining walls are covered with three tiers of frescoes: the top tier is devoted to scenes from the Life of the Virgin Mary (to whom the chapel is dedicated); the middle and lower tiers depict scenes from the Life of Jesus; in all, a total of 39 scenes. Unlike the flat and highly stylized Byzantine style of mural painting practised by other Italian artists of the trecento, Giotto's frescoes in the Arena chapel exemplify his naturalistic approach to art, based on personal experience and observation. Byzantine paintings were based on fixed attributes - members of the Holy Family were always drawn bigger than saints and other people; figures were typically positioned according to the requirements of the narrative, rather than the rules of perspective; characterization was minimal, being alluded to by the use of certain colour pigments, personal attributes or other set features; in short, pictorial characters were positioned in stiff, conventional poses, and painted according to a rigid icon-like formula. Giotto's religious paintings - influenced to a degree by Cimabue (1240-1302) - was completely different. His figures had life. They looked much more like real people, with natural faces, experiencing real emotion. Characters were given space within which to move, as well as real-life poses, and they were positioned much more in accordance with basic rules of perspective. Their sculpted bodies were much more obviously three-dimensional, and clothed in garments that hung naturally and appeared to have proper form and weight. The overall result was a far more sympathetic and realistic illustration of the Bible. At the same time, he took great care to ensure maximum clarity. After all, the pictures were supposed to be easy to "read". So he chooses his individual scenes with great care. Every person in the story is there for a reason; every gesture is important. The lower parts of the walls - those areas within reach of the congregation - were decorated in a faux architectural scheme to resemble marble, featuring imitation statues of seven Virtues along one side, contrasting with seven Vices on the other side. In the early years of the 14th century, this type of illusionistic painting was totally revolutionary. Art experts have traced several sources for Giotto's particular interpretation of the gospel narrative, including Meditations on the Life of Christ by the Pseudo-Bonaventura, and the Golden Legend of Jacopo da Voragine in respect of the Virgin Mary. Two of Giotto's most moving works of Biblical art in the chapel are the Betrayal of Christ and the Lamentation. One of the most dramatic paintings in the Scrovegni Chapel is Giotto's depiction of The Kiss of Judas: the moment when Jesus was betrayed by Judas Iscariot in the Garden of Gethsemane. The picture exemplifies the intensity which Giotto brought to the depiction of biblical scenes by his emphasis on the drama of the occasion. 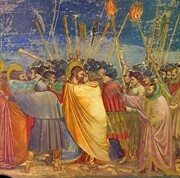 Although many other artists portrayed the actual kiss, Giotto shows the powerful face to face confrontation between the two men. Capturing the chaos and confusion of the arrest of Jesus, Giotto places the two protagonists in the centre of the crowd. Judas places his hand on Christ's shoulder, raising his treacherous yellow cloak in the process. This has the effect of momentarily placing both men in an eyeball-to-eyeball situation, as if to demonstrate that each needs the other to fullfil their destiny. But while Christ's face is perfectly at ease, that of Judas is puffy with corruption. Meanwhile, soldiers have burst into the scene from the right, while to the left Peter severs the ear of the high priest's assistant. Indeed Giotto uses every formal device available to him in order to emphasize the drama of the moment: the nocturnal lighting; the halberds and other raised weaponry; the facial expressions, gestures and positions of the figures; and the diversity of the drapery folds. The Lamentation shows the grief-stricken reaction of friends and apostles to Christ's death. Some of the women tenderly cradle the rigid corpse, while others observe events in shocked silence. Each person is a carefully observed study in sorrow, while above them ten angels are contorted with heartbreak. Another two figures sit close to the dead Christ, with their backs towards us, as if to reinforce the privacy of their woe, and exclude outsiders like ourselves. In the background, a barren landscape offers minimal distraction, while the slope of a hill directs the eye toward the head of Christ. Above all, in contrast to Gothic or Byzantine artists who tended typically to depict the death of Jesus as an example of the eternal superhuman conflict between Good and Evil, Giotto is far more down-to-earth. His main preoccupation is simply to emphasize the sorrow and sadness of a person's death. In conclusion, Giotto's Scrovegni Chapel frescoes represent a decisive moment in the evolution of Western fine art painting. Effectively a breakaway from the flat Byzantine idiom, the pictures exemplify the new "modern" style - a style taken up and perfected by Renaissance painters such as Masaccio, Botticelli, Leonardo, Michelangelo and Raphael - none of whom could plausibly claim to have achieved what they did without Giotto di Bondone. Not surprisingly therefore, Giotto is considered to be the founder of Renaissance art.  Annunciation Triptych (1333) Uffizi: by Simone Martini (1284-1344).  Allegory of Good and Bad Government (1338-9) Palazzo Pubblico, Siena: by the fresco painter Ambrogio Lorenzetti (c.1285-1348).  For more masterpieces, see our main index: Homepage.